Ever since I have become interested in Dogme, I have heard the same old arguments against unplugged teaching and I’m becoming a little bored of them, to be honest. You know them, the old ‘you hate technology’, the familiar ‘you just make it up as you go along’, the hoary ‘what’s so wrong with course books anyway’, and so on. I don’t feel the need to go over these now, I think that they’ve been conclusively disproved or discredited in numerous blogs posts by my PLN and most comprehensively in the Teaching Unplugged book. It’s when you go to a conference like this that you can end up confronting these prejudices face to face. Martin Sketchley (@eltexperiences) gave a session in Glasgow where he presented his Master’s thesis on Dogme ELT. He posited the idea that, based on his research, a balanced approach between teaching unplugged and more traditional, possibly course book based activities was the most effective way to teach. It was a measured argument, based on his research and a fair conclusion. I can’t argue for or against Martin because I haven’t read his thesis, but I would like to know how he felt about the talk afterwards (and if you’re reading this Martin, please let me know in the comments section) because I felt his talk was somewhat hijacked by audience. There’s something about Dogme that seems to make the discussion go up a few notches and this discussion was no exception. I thought that it was unfortunate that at times the pitch of the argument became too exaggerated and I felt it made a genuine conversation difficult. The most telling comment for me was from a teacher who said that before the session she didn’t know what Dogme ELT was and now at the end of the discussion she felt she didn’t know much more. I’m not blaming Martin for that, in that environment it would have been difficult for him to calmly get that across, but I couldn’t help that feel it was a wasted opportunity. What could have been an opportunity for her to learn was instead a chance for her to feel that she had become confused by a heated argument, which can’t be the best way for any of us. Adam and Emily in action. There was another comment which I also thought was telling. An older teacher forcefully, and to be frank, rudely made the point that since she’d been teaching like this for 20 or 30 years, she couldn’t see what the fuss was about. This is when I refer you back to those tired old anti-Dogme arguments that I mentioned at the beginning. This is another one of those old chestnuts, the classic ‘this is nothing new so what’s the big deal?’ point of view. Adam Beale and Emily Bell‘s presentation the preceding day provided an excellent counter point to this perspective. Adam has been teaching for only two years and decided to undertake an action research project into teaching unplugged at his school in Santander, Spain. What his research and brilliant blog, where he reflects on his classroom experiences, have shown is that Dogme ELT is eminently teachable by an inexperienced teacher. For Adam to have discovered this way of teaching and been on the journey he has, something important and valuable to him not just as a teacher but as a person, Dogme ELT needed to exist, it needed a name, it needed a community, it needed teachers to call themselves Dogmeticians, it needed blog posts, it needed conference talks and workshops, it needed research and reflective practice, and it needed a book. Without these things he wouldn’t have found it and we wouldn’t have had the great Dogme chats we had in the cafe and pub, important events for both me and him (I hope). So if you’re not a Dogmetician and you find yourself wondering why us teachers with an interest in teaching unplugged are banging on about it again, remember these things. We still have to face the same accusations and defend ourselves against them. No less than Jim Scrivener accused Dogme teachers as being “unprepared” and most memorably as “wandering naked though the Dogme forest” in his otherwise excellent talk in which he otherwise gave one of the most compelling arguments in favour of Teaching Unplugged I’ve ever heard. If he can misunderstand what Dogme is all about, then we’ve still got a long way to go. Very nicely made point there, James. Just because X teacher has renounced Dogme as the practice of the guys who 'wing it' doesn't mean the rest of the teaching world can't benefit from entering into discourse on the topic. We develop our ideas through communicating, sharing and adding to each other's knowledge. Another important argument. It strikes me as slightly self important that some people might say “well, I've been doing this for years, it's hardly anything new, what's your point?” I mean, Dogmeticians aren't trying to throw ludicrous claims around like having invented the wheel, just looking at things throw different glasses, that's all. Great post James. I wasn't at the conference but I think the people commenting/criticising Martin's talk just sound damn rude. This is what puts me off conferences in fact. You shouldn't go to talks to be 'taught' but to learn about someone's experience. This is particularly true of newish or just average teachers like many of us are. Yes, if you go to a published expert's talk you may get a lot more but I personally prefer real life teaching experiences like Adam's and Martin's. In fact, I'm sure Martin didn't advertise his talk as 'a concise introduction to Dogme ELT'. I also think that some people are just getting overcritical of Dogme due to it's popularity. It seems to divide people into camps but,as you say, it has given many of us a common language of umbrella term to use in order to reach out and discuss ideas, approaches and experiences with other teachers. I don't know of any other movement in ELT that has such welcoming, helpful and supportive members and best of all everyone is learning as there is no right way of doing it. It is this self discovery that is the key and which you can't teach or explain in a talk. For example, I can't tell you how to teach your class and your learners because only you can do that. I can, however, what seems to work in my situation and maybe you can take things from that. Critics can scoff and claim to have 'been Dogme for centuries' but for many of us we don't care. It gives us a platform on which to develop and is flexible to allow us to bring in, use and grow our own style. Many people say it is 'the magic bullet' but I tend to believe it is the key to unlocking your potential to become a great teacher and it gives you the confidence and support network to help you. I just don't understand the tendency for teachers to be 'dogmatic' about any one approach nor do I really understand the reluctance to learn about and try new things. As a steacher of 30+ years I still love new ideas and I think we all owe it toi our learners to be aware. Thank you James for this very lucid piece of writing about the sometimes shallow way we look at things. I wasn't at any of these talks (more's the pity) and I know we sometimes make fun of Dogme ELT (as with other things too) but I think the really scary thing is to close our minds against anything. Why is it that I was surprised that there was still a lot of talk on dogme in Glasgow? And why is it that I'm surprised there are still so many critics, especially of the “I've been doing that for 20 years” sort? Like Scott said at one time, “Good for you!” Fuss? There is no fuss really, is there? Some people are curious and want to know more about it. That's no fuss. Martin tried to be scholarly about it, to have it investigated “formerly”; that's no fuss. A lot of dogmeticians talk about it – because they're curious as to how others are teaching; that's no fuss either. Trying to be a better teacher is no fuss, surely? So, why are these critics trying to put the fuss where there isn't any? Could it be that there is fear of the multi-million pound publishing industry being affected? Dogme or not, it will be anyway. Nicely put James. 🙂 It's amazing how often the people who complain about the amount of coverage dogme gets are also ones who (indirectly or otherwise) keep the debate alive!! As for the “that's what I've always done” or “I do that anyway” remarks, I find that the majority of times that simply isn't true. A few questions and it turns out that the teacher who said that is actually just doing the odd lesson away from the coursebook or not using a coursebook but still adhering to a pre-defined syllabus. Thank you James for writing up a blog post about Dogme and the talk that I presented during IATEFL. Rather than write up one long comment, I decided to post my own blog which was inspired with your blog post (http://www.eltexperiences.com/2012/04/reflecting-on-criticisms-of-dogme-elt.html). Thanks Dale. Obviously I agree with everything you say(! ), but a couple of weeks on, I worry that by writing about the tired old arguments as I did at the beginning, I might actually come across as wanting to shut down discussion rather than open it up. Ah well, hindsight is 20/20 and all that…. Thanks Phil, I couldn't agree more and I love that final paragraph. You summed it up perfectly. I'm always happy to see another teacher talk about being open to new ideas, I just hope I didn't come across as the opposite at the beginning of this post, as I commented above to Dale. Hehe, excellently put as always, Chiew. As you say, why the fuss? There's too much hot air and not enough getting on with it, in my view. I think sometimes we can get so caught up in arguing our postion, it distracts us from the more important task of sharing what we do. So no more fuss! Cheers Dave. You're more than welcome to refer back to the now seminal “5 stages of Dogme” any time you like. It's become a key text on the subject! When I was talking to Adam after the talk, I made the same point as you. I'd bet a hefty wager that the critical teacher in our session doesn't teach anything like what Martin was describing and what we consider Dogme. I'm not sure why, maybe it's because I've never met or spoken to a Dogme who was as closed minded and rude as she was at that moment? Thanks for taking the time to reply Martin, I've updated the post with a link to your blog. Cheers James. 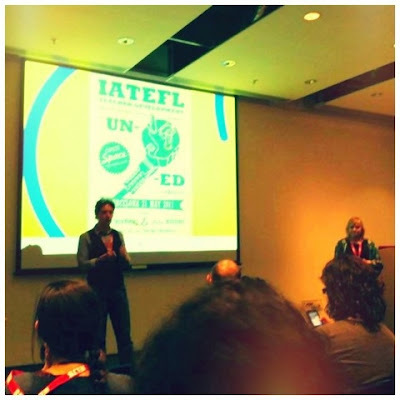 It was wonderful reflecting back on my IATEFL talk. The previous week, I was in my hometown and I visited my old school that I taught at. Some of the teachers came up to me and were asking about Dogme ELT and the best way to go about incorporating it in their Experimental Teaching Practice. For me, it was wonderful to find that teachers were still encouraged and motivated to develop their teaching from a small workshop that I provided at the school. Nevertheless, it was wonderful to receive a reply on my final thoughts and reflections with regards to Dogme ELT. I shall be writing a new blog post soon that will include various ideas about teaching in general and perhaps an idea/structure of a 'balanced approach'. I have been meaning to comment on this for ages. So sorry for the delay. A really nice post and I think the comments above really say it all. What i really wanted to say , was that those chats in the cafe and the pub did mean something and they were important events for me too. It was a pleasure meeting you and I look forward to seeing you again, soon. Thanks Adam for stopping by, and I'm glad you appreciated it. See you next time!